Thank you very much for a great job. I had forgotten how white the house could be.Also for the very prompt and professional service. Price was excellent, will definitely recommend you to others. Thank you so much, Perfect Vision, for the great pressure washing job that you did today on my home, pool deck and pool screen! Everything looks brand new! You did a fantastic job and I will be recommending you to all my friends! Thanks for coming out and cleaning our house and pool area! It was a great price and looks amazing! You even got rid of some wasp nests for us in an area we didn’t even ask about! Above and beyond, thank you!! Wonderful job by honest, hard working employees at a fair price! Just wanted to tell you how much I appreciate your company. You have pressure washed and cleaned our windows a number of times over the past 10 years for both of our homes I’ve owned. You have always done a great job, all of your staff are outstanding, and you have the best follow up. It’s just such a pleasure to deal with a company like Perfect Vision Window Cleaning and Pressure Washing where you know things are going to be done right and i would always be dealing with friendly and trustworthy people. 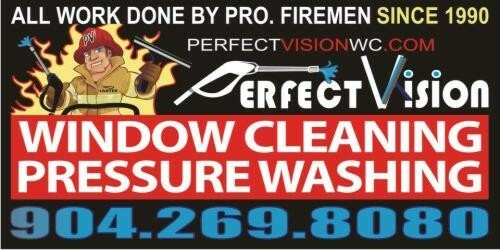 You are the ONLY pressure washing and window cleaning company I’ll ever use. Just want to say thank you for a job well done, Dwight’s very professional I’ve put your card on our refrigerator and will be recommending you to our neighbors. Thanks and be blessed. We were completely satisfied with the work performed and felt like the guys really took pride in their work, I have already recommended you to my friends. I posted your info on two Facebook groups here locally as well. I was pleased with the results and I know that you have been to a couple of my neighbors. I have recommended your company to my friends. Hopefully they call you….Thank you! It is always a pleasure doing business with your team!!! Everything looks beautiful! You always do a wonderful job and I appreciate it. I will refer you to all my friends an family. Excellent job. Extremely happy & will call again when needed. Mike – We had Dwight out yesterday to power wash our pool deck. He was amazing! We recently moved into the home and the pavers were black with what we thought was mold – but I think it was mostly dirt and neglect. In any case he was on time, efficient and did a wonderful job. I will definitely recommend him and your company to anyone I know that needs your services. We will definitely reach out to you again for additional cleaning and power washing projects around our new home. Thanks so much. Another great job by Dwight today!! Always happy with his work and have passed on your number to many in the neighborhood!! Thank you for an outstanding pressure washing and window cleaning job on our home recently. You did the job to perfection. I will definitely recommend you to friends. We had a lot of ornamental stones that were badly mildewed. You brought them back to their original whiteness. I do want to be an annual customer. Thank you. We were very happy with the work that was done and would definitely recommend you to friends. Thanks you. Everything was awesome. I sent an email out to my office (I’m a Coldwell Banker real estate agent) highly recommending you to our agents! And I also said wonderful things about you on my personal and business FB page! Yes see you in 6 months! Thanks for meeting our appointment and for being on time. That is as valuable as the service provided. The pool deck, screen and driveway looks great. Yes. It was very good. Exceeded my expectations. Looked great when the team left. I will recommend you folks.